Organic green spring onions, chopped into 3 mm pieces. Can be added to soups, noodles, or other dishes for flavor. These organic greens spring onions have been finely pre-chopped into small 3 mm pieces and are ready to add to all sorts of soups, noodles, or other dishes such as okonomiyaki. Green spring onions contain carotenoids, such as Vitamin A, which are beneficial for vision. 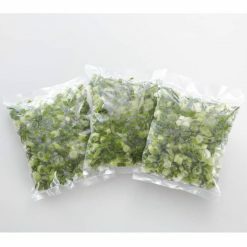 They also contain vitamin C and vitamin K.
Because the green spring onions come portioned into three bags, it is easy to use only your desired quantity at one time and leave the rest frozen. Sugarlady’s vegetables are harvested in season and then frozen immediately in order to ensure the highest possible nutritional value and best flavor. Green spring onions are used to flavor many traditional Japanese foods, such as miso soup or okonomiyaki. Miso soup is made using fermented soybean paste and small quantities of tofu, seaweed, and green spring onions. Okonomiyaki, which is a little bit like a savory pancake and is especially popular in Western Japan, often mixes green spring onions as well as cabbage, meat, and other ingredients in with the batter before frying. Green spring onions can also be added to many types of Japanese noodles, including soba, udon, ramen, and soumen; as well as many Western dishes, from soups to baked meats. Our frozen organic green spring onions need not be defrosted to add to soups or okonomiyaki batter – simply add frozen (to the okonomiyaki batter, or to the soup when it is nearly finished), and let thaw to perfection. No need to worry about overcooking! 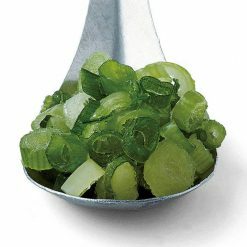 When using as a flavoring for noodle dishes, the green spring onions can simply by lightly blanched before adding. This product contains organic green spring onions (China). Origin of ingredients: green spring onions (China). Prepared and packaged in China.